Folks: pardon the delay in getting this next installment out. I wasn’t able to finish it before I had to head for the train, and there is no Internet access on the train. Once here in New York, it took me a while to figure out that I wasn’t going to be able to connect to the Internet from my hotel. But thank heavens for Starbucks! I’m sitting in one right now, sipping a hot chocolate and nibbling on banana nut bread, catching up on my emails and sending this to you. After Walt Disney built Disneyland back in the mid 1960’s, he quickly came to regret not purchasing a much larger plot of land. The hotels and restaurants that sprung up around his park were not up to his standards and, of course, not under his control. He vowed not to make that same mistake again, so when he began planning Walt Disney World he first, under great secrecy, purchased a whopping 28,000 acres of land here in the Orlando area. Starting with the Magic Kingdom, the Disney company went on to build a number of additional parks: Epcot, the Disney/MGM Studios, various water parks, and Disney’s Animal Kingdom. Not to mention Downtown Disney, and innumerable hotels, golf courses, and even camping areas. In addition, there are a number of non-Disney attractions, including Sea World and Universal Studios Florida. Clearly, there is way too much here to take in on a single trip. I concentrated on two parks: the Magic Kingdom and Epcot. If you are driving, getting to the park can be a bit of a challenge. For some reason, the roads around here are a real maze. You need to pay very close attention to all signs; nearly everything says “Disney” something-or-other, and you have to navigate numerous freeway-style interchanges before you actually get to where you are going. For that reason alone, if you have the option I would highly recommend taking the Disney shuttle from your hotel. Plus, you save the parking fee. If you must drive, have a capable navigator in the right seat to guide you to your destination. Given all of that Florida real estate, the most obvious difference between Disneyland and Florida’s Magic Kingdom becomes apparent just as soon as you have purchased your ticket. In California, you simply walk from the ticket booth to the entrance gates, mere steps away. Not so in Florida. 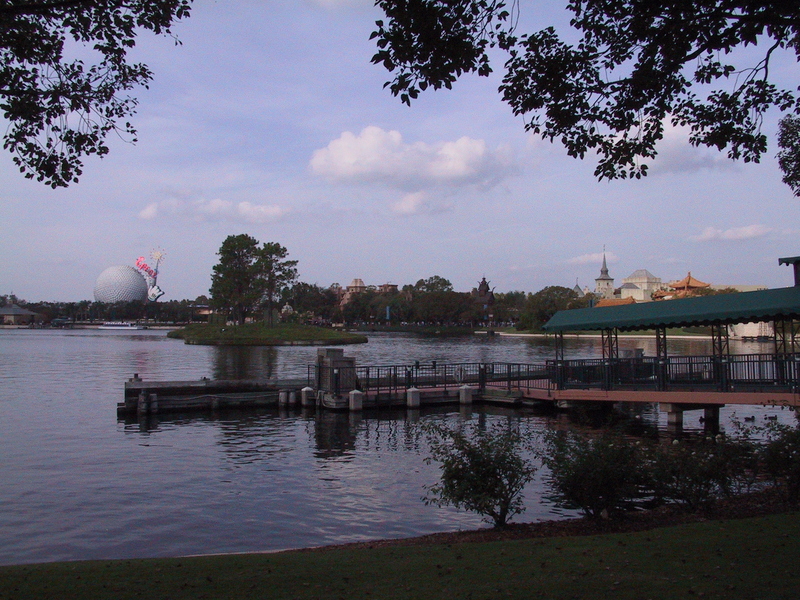 Here, Disney actually built an artificial lake right in front of the park entrance. After having purchased your entrance ticket, you have the choice of either getting on a Monorail and riding it to the park, or getting on a ferry boat and taking that to the entry gates. I took the ferry; not only is it a more interesting way to approach the park, but from the middle of the lake you can also get a good view of the various lakeside hotels and resorts. Once inside, Disney’s Magic Kingdom will look very familiar to those of you who have been to Disneyland. In fact, unless you are really familiar with Disneyland, you could easily confuse the two. Both parks have the same basic layout, and most of the rides you know and love are there, and in the expected locations. The most visible difference? There is no Matterhorn Mountain in the Magic Kingdom. As well, the locations of the Haunted Mansion and Big Thunder Mountain have been swapped, and the area surrounding the Haunted Mansion has been named “Liberty Square” (this is also where the Hall of Presidents—kind of a Great Moments with Mr. Lincoln on steroids—is located). But the train still circles the park, rocket ships still zoom through Space Mountain, that rhino still has those natives up a tree on the Jungle Cruise, Pirates still threaten the innocent townsfolk in Pirates of the Caribbean, and there are 999 happy haunts hoping you’ll join them in the Haunted Mansion. Oddly, the Pirate ride is shorter than the Disneyland version: the entire burning town scenes at the end of the ride have been omitted. On the plus side, the Haunted Mansion is almost completely identical to the Disneyland version, and they don’t re-theme it based upon “Nightmare Before Christmas” as Disneyland does from Halloween to New Year’s. I was very excited to see that the Magic Kingdom still has the original (well, slightly updated) Carousel of Progress! Disneyland turned it into “Innoventions” and, in my opinion, completely ruined it. If you miss this ride as I do, be sure to visit it here in the Magic Kingdom. More for the nostalgia files: here they have something similar to the old People Mover. That ride has been gone from Disneyland for a long time now. The one here doesn’t seem to get all that many riders, so it may not be long for this world either, but it is fun to ride it and reminisce. The Magic Kingdom also has a “Circle-Vision 360” theater, but it was closed (and was most recently showing something called “The Timekeeper”, not the old “America the Beautiful”). Smaller changes abound. The exterior design of the Haunted Mansion is different (it is a brick building, here). The castle in the center of the park is Cinderella’s (Disneyland has Sleeping Beauty’s castle). And the shops on Main Street are much less interesting here; most are selling the stuff you’d find in the Emporium in Disneyland. There is no Magic shop, no glass blower, no Disneyana shop. None of the “specialty” shops you find in Disneyland appear to be present here in the Magic Kingdom (but they do exist in the other parks here). The Tiki Room show has been updated, but I’d bet you almost anything that they are updating the Disneyland show to match, so that hardly counts as a change. Missing are the Indiana Jones ride, the Matterhorn, “Honey I Shrunk the Kids,” and Star Tours—although the latter two can be found in the Disney-MGM Studios park. New—well, it takes the place of Great Moments With Mr. Lincoln, but they are hardly comparable—is the Hall of Presidents. This thing is excellent; be sure and see it. They have animatronic versions of each of our Presidents, from George Washington right up to the current George W Bush. Mr. Bush and Mr. Lincoln do the speaking, but all of the others fidget and fuss throughout. It is very impressive; they would do well to import this one to Disneyland. If you are comparing only Disneyland and the Magic Kingdom, I think that Disneyland wins hands-down. But that isn’t necessarily a fair comparison, since nowadays you really need to compare the entire Disney complex in California (Disneyland, Disney’s California Adventure, and Downtown Disney) with the one here. And given the sheer size and variety of offerings here, Florida’s complex comes out on top. I spent a good part of one day in the Magic Kingdom. It easily would have taken an entire day, but the crowds were light, I didn’t ride the roller coasters, and I skipped Mickey’s Toon Town. I then spent an entire second day at Epcot. This is a park you can definitely do in a single day, although don’t sell it short: spend the entire day and explore everything it has to offer. I think you will like it. EPCOT once stood for “Experimental Prototype City Of Tomorrow.” As originally conceived by Walt Disney, it was to be a utopian community where people lived, worked and played. 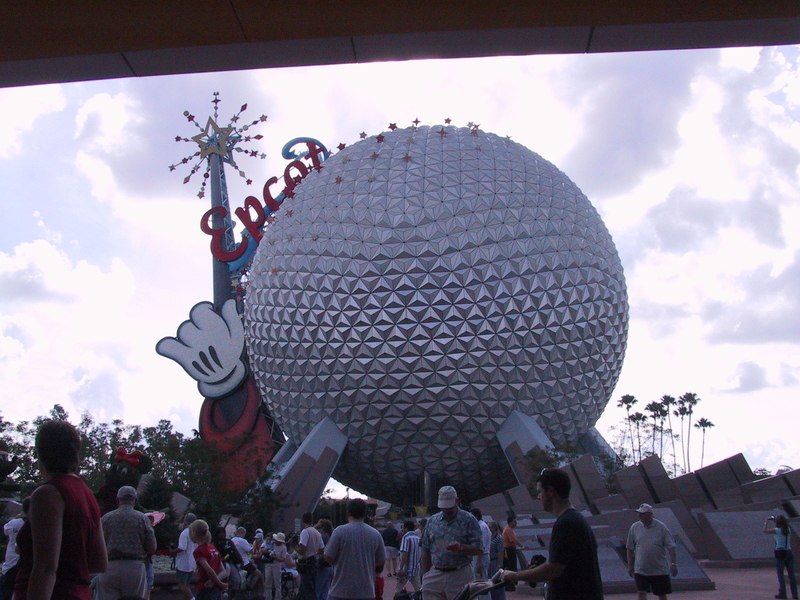 The design changed over time, however, and what is left is simply named “Epcot”: the name doesn’t appear to stand for anything any more. (For what it’s worth, the idea of a utopian community does survive in a separate Disney development named “Celebration.”) What remains is hard to describe. Its purpose seems to be education, using Disney’s usual techniques to make learning fun. If likened to a school, Epcot is divided into two main disciplines: Future World, which covers Science and Technology, and World Showcase, which is the equivalent of a World Studies class. Fortunately, there are no English, foreign language, or math courses! I’ve posted the pictures from my day at Epcot along with the others from my trip: [deleted]. I drove to this one (and got hopelessly lost; it took me quite a while to get turned around and back on the right track). Upon entering the park, you find yourself standing right in front of “Spaceship Earth.” Using projections and animatronic robots, this is a slow tour through the history of communications in a People Mover-type car. It’s pretty well done, as most Disney rides are, although don’t really expect to learn anything you didn’t already know. Once out of that ride, you discover that the guy who designed the roadways around this place must have also designed the Future World layout. What looks to be extremely simple on the park map turns out to be very complex in practice. I mean, you sit in one spot until you are positive that you have yourself precisely located on the map, with the map properly oriented given the surrounding buildings, and yet when you strike off towards your intended destination you quickly discover that you are hopelessly lost. The map doesn’t appear to be wrong, it’s just that for some reason translating the map to reality is extremely difficult. Fortunately, the World Showcase half of the park is arranged around a central lagoon such that your only choice is to either go clockwise or counter-clockwise. It’s pretty hard to get lost in that section of the park. After I got out of Spaceship Earth I headed for what I thought was Universe of Energy. Somehow, I wound up at GM’s Test Track ride. Fortunately, I wanted to try it out, too, so I just changed my agenda and went on the Test Track next, instead. Test Track is sponsored by GM, and purports to show you how they test their automobiles. The queue area takes you past a number of working test rigs that are bashing, stretching, and otherwise abusing various car parts. But I didn’t get much of an opportunity to look at all of this: a number of the rides in the Future World section not only use the FastPass system (where you can kind-of make a “reservation” to go on a ride, and then at the appointed time you practically walk right on), there is also a separate line for single riders. As you can guess, that suited me just fine! I walked right to the head of the line, no FastPass needed, and got on in very short order. It makes sense; they always have an extra seat or two, and filling them with single riders is more logical then letting them go empty. The Test Track ride is sort of a cross between Mr. Toad and Indiana Jones. It starts out somewhat slow, going through some “road tests” (including a “crash test” that is similar to what you go through in Mr Toad when you crash through the wall at the end), but then the ride really takes off. Suddenly you find yourself whipping along in excess of 60 MPH, zooming in and out of the building. This is all on a relatively level track; there are no loops and no real hills. The sheer speed makes for a pretty impressive finish, though! Once off the cars, you walk through what is basically a new car showroom without the salesmen (although there is an information desk where you can find out more about the GM cars on display). Here you have the opportunity to enter a drawing for a new Cadillac SUV. From this ride, I once again got my bearings and headed towards Universe of Energy. But HP’s new Mission: SPACE ride was on the way, so I decided to ride that one next. Again, the single-rider line makes the boarding process quick and painless. But then comes the ride. Repeatedly they warn you about a number of aspects of this ride. If you are AT ALL prone to motion sickness they advise you not to ride. If you have problems with claustrophobia or pitch darkness, they advise you not to ride. They warn you about this over, and over again. And you know what? They are NOT kidding. This is the first Disney ride I’ve ever known that has motion sickness bags at every seat. They actually point them out to you! This ride is a simulated mission to Mars. You “travel” in groups of four, with each person being assigned a job: Commander, Pilot, etc. The four of you are placed in your spaceship side-by-side. There are something like ten or twelve of these all attached to a heavy-duty spider-like arrangement overhead (imagine a giant claw, with each car—holding four people each—attached to the tips of the “fingers”). This allows them to orient the cars in any direction and to spin the cars as a group to simulate acceleration and gravity. Once you are in your seat, an overhead safety bar lowers and then the control console in front of you advances until it is a foot or so in front of your face. You are packed in tight at this point, hence the claustrophobia warning. The console has a cool air vent blowing right into your face at this point, thank goodness! Now the thing is oriented and spun in such a way as to simulate strong acceleration, while the screen on the console in front of you shows you “blasting off.” You go into simulated cryogenic-sleep (hence the darkness) and then “awake” seconds later in an emergency situation: there is space debris all around you. Your ship has to execute a number of violent maneuvers in an attempt to avoid mishap. This is very similar to Disneyland’s Star Tours ride, where you avoid and occasionally crash into what appear to be giant chunks of ice. Eventually your ship reaches Mars, swoops through some canyons in an out-of-control manner, and makes a crash landing, skidding right to the edge of a cliff. All in all, it is an interesting, but extremely intense, experience. I’m not all that motion-sensitive but I came off the thing feeling a bit queasy. I’m glad that I’ve ridden Mission: SPACE; now I don’t need to ride it again. I wouldn’t be surprised if they either tame this one down or shut it down altogether: it really seems to step over the bounds of what is acceptable for a ride at a Disney park. As you exit the ride, you are taken through a large room where you can enjoy various hands-on activities to learn about Mars and space travel in general. I skipped that part, but there appears to be a lot you can do there. Finally, I made it to Universe of Energy. This “ride,” like most in the park, is clearly not your typical theme-park ride. For one thing, it is 45 minutes long… Hosted by Ellen DeGeneres and Bill Nye (“the Science Guy”), it is a humorous introduction to where and how we obtain energy. After an 8 minute film that sets up the “story,” you proceed into what at first looks like a large theater. You quickly realize that the seats are organized into giant cars that take in excess of 100 people apiece. Once everyone has been seated, the presentation begins. At first everything is on the large screens in front of you, but soon the cars rotate, and then slowly begin to move. 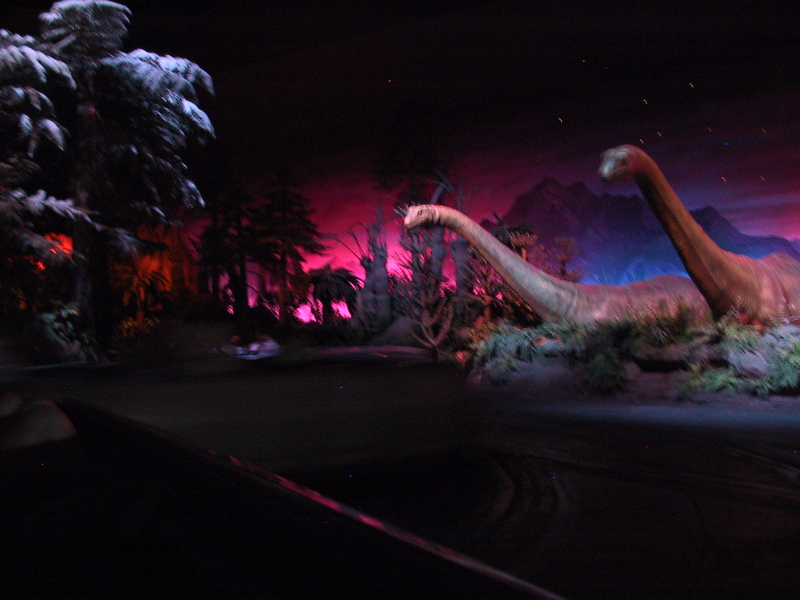 You wind your way from room to room, learning about the subject through both on-screen presentation and animatronics. All in all, it’s pretty good. It’s a nice way to get people thinking about energy production (and, to a disappointingly small extent, conservation) while keeping everyone engaged. After Universe of Energy, I decided to make my way to the other half of the park: the World Showcase. Here, arrayed around a large lagoon are a number of “pavilions” each showcasing a different country. Currently, there are 11: Mexico, Norway, China, Germany, Italy, USA, Japan, Morocco, France, United Kingdom, and Canada. One of the reasons I decided to head to this half of the park at this time was the fact that I was hungry, and each pavilion, in addition to showcasing the best that the respective country has to offer, sells appropriately-themed food. Thus, I had the choice of Chinese food, Mexican food, you name it. And drink. This is NOT your father’s Disneyland. Disneyland has a strict no-alcohol policy (with one exception that is not open to the public). Not so here. 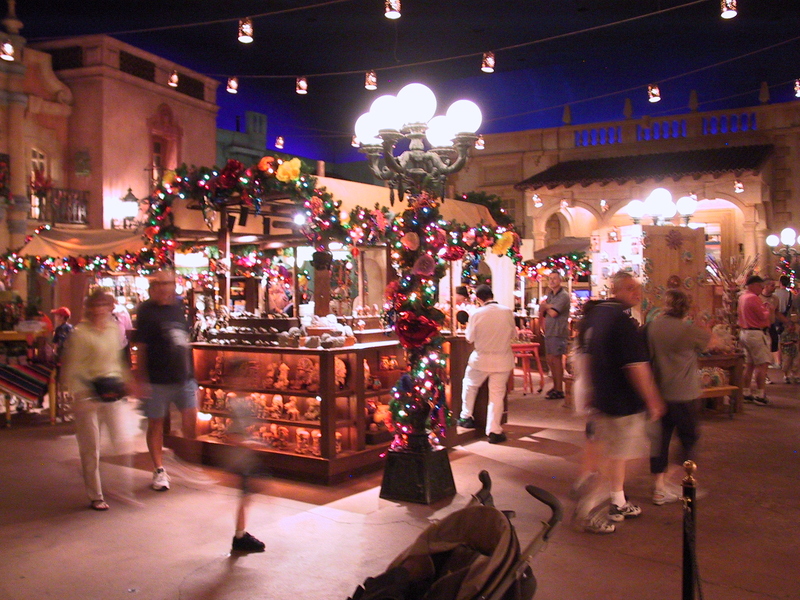 In the Mexico pavilion, they serve Margaritas. Want beer? Most pavilions have it: various German beers in the German pavilion, Bass or Guinness in the UK pavilion, and so on (I didn’t check what they serve in the USA pavilion – probably Bud or Michelob or something). How about wine? You’ll find wine for sale, by the glass and by the bottle, in the French pavilion. They even do wine tastings! Food service at most of the pavilions comes in two varieties: counter service, or restaurant-style. The restaurant-style restaurants take reservations. And as you might expect, they charge accordingly. I never ate in one of these nicer restaurants, so I can’t tell you if the food was worth the extra expense. Me, I had Chinese takeout. And I couldn’t resist a beer from the German pavilion. Each pavilion is designed to show the host country in its best light. At first, I wasn’t all that interested, but after lunch I explored the China pavilion and I quickly realized that I really ought to check out each one. Call me sentimental, but the China pavilion has a Circle-Vision 360 theater. And unlike the one in the Magic Kingdom, this one was operating. I haven’t been in one of these since they closed “America the Beautiful” at Disneyland, and I’ve always thought that doing so was a mistake. This “theater in the round” is a great way to show off a country such as China. (Although I must say that the part where the camera came out of the forbidden city and proudly showed off Tiananmen Square struck me as a bit odd.) In addition to the theater and the Chinese restaurants, the China pavilion contained a really good display of ethnic Chinese clothing. The star attraction at the USA pavilion was a 30-minute history of our country put on in their 1000 seat theater. Hosted by animatronic versions of Ben Franklin and Mark Twain, the show was part film, part robot. Prior to the show a group of a capella singers entertained the waiting guests. France showed an 18 minute film, “Impressions de France,” that presented the cities, towns, and countryside of modern-day France. Canada also had a Circle-Vision 360 theater; they similarly used it to give you a great visual tour of Canada. The UK seems to have one of the bigger pavilions, although they don’t have any kind of ride associated with theirs. 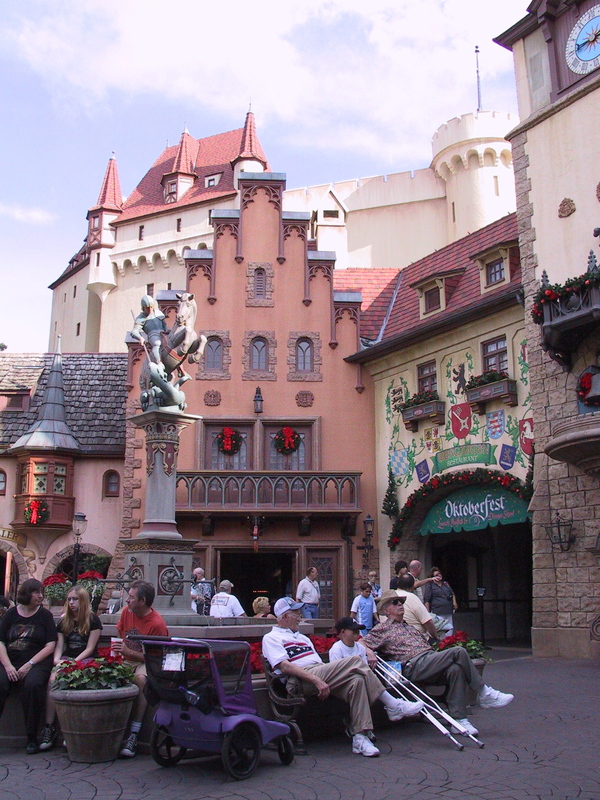 The UK pavilion consists of shops (selling products of the UK—including Scotland and Wales, and a large shop that sold various items emblazoned with your family crest), pubs, fish-and-chip places, and an outdoor stage where a group was doing Beatles tunes. Mexico has an actual ride in their pavilion. 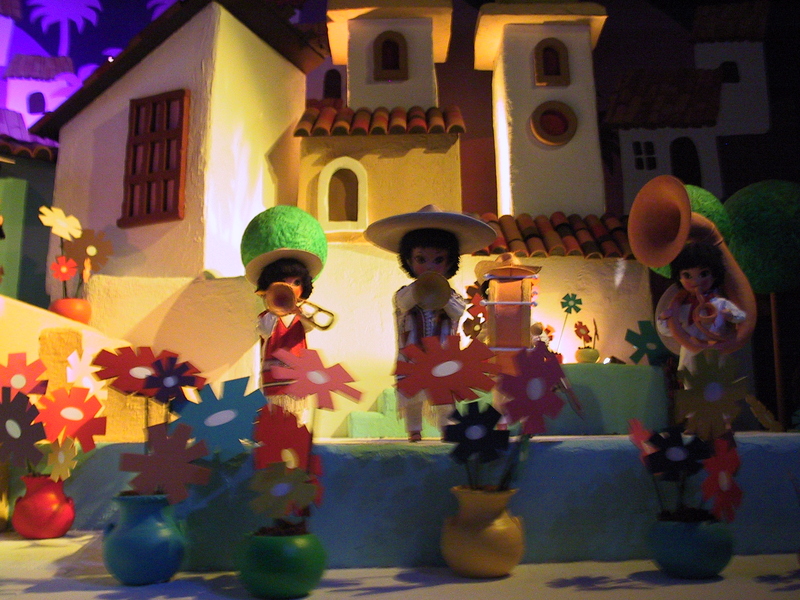 It is a boat ride that is sort-of a cross between “Pirates of the Caribbean” (for the caverns) and “It’s A Small World.” As you can see from my pictures, one room seems almost lifted from that latter ride (although they aren’t singing the Small World song!). Their shops sell serapes, sombreros, figurines; all the stuff you’d expect. And, like the others, they have two different restaurants: one takeout style and one where you are waited upon. One thing to be aware of if you visit Epcot: the two halves of the park have different hours. After circling the World Showcase lagoon and exploring all it has to offer, I still had two hours until the closing fireworks show. I decided to spend some of that time going into areas of Future World that I had not yet explored. In particular, I wanted to check out “The Land” and “The Living Seas.” Again, crossing into that half of the park was like going into the Twilight Zone: I got seriously lost, and twice had to consult the map and reorient myself. When I finally made it to “The Living Seas,” it was obvious that it had closed. I then took a closer look at the schedule of show times I had been handed along with my park map, and to my dismay discovered that although World Showcase was open until 9:30 p.m., Future World closed at 7:00. You could still walk through Future World, fortunately, since the Main gate from which I entered—and outside of which my car was parked—was on the far side of it, but the place was almost completely devoid of people. Kind of creepy, really. To kill time, I took one last tour of the World Showcase, but there was little to see that I hadn’t already seen (except a really neat exhibit of tin toys in the Japan pavilion). By 8:30, I was done. I saw little need to hang around for yet another hour just to see the fireworks show, so I headed back to my hotel. Speaking of my hotel, if you are planning a trip to this area I can definitely recommend the hotel I stayed in. The “Doubletree Club Lake Buena Vista” (quite a mouthful) is a family-oriented hotel about as close to the official Disney Resort as you can get without being in it. By not being part of the official Disney Resort, you save a lot. The location is in some ways better, too, since this hotel is right across the street from nearly every restaurant imaginable. It has a cocktail lounge in the lobby, wireless Internet service throughout the hotel, a coin operated laundry (which I took good advantage of), a concierge that will sell you tickets to most of the area attractions, and a free shuttle bus to and from the Disney complex. There is a regular Doubletree hotel about two blocks from this one, but it is more expensive. Fresh and clean (it was recently purchased and renovated by Doubletree), convenient and cheap—what more could you ask for? My time here in Florida was spent pretty much in three places only: the Disney parks, the Space Center, and within walking distance of my hotel. Thus I can’t say much about Florida in general, other than to note that even in mid December it was both hot (mid 80’s) and humid. I cannot imagine what this place is like during the summer. And there was a lot of visible evidence of hurricane damage, so parts of the year must be really nasty. Orlando itself appeared to be a typical American urban sprawl. No worse, but not visibly better, than your average American city. But most people don’t come here for the city itself, they come for the attractions. And this one must have the largest concentration of theme park-style attractions of any place in the country—or, for that matter, the world.